Hey guys, Head Nerd Grace here. This recipe comes from my good friend Casie, and was a big hit during our joint birthday The Last Jedi party. I had to set a few aside during the party to make sure they wouldn't all be gone before I got a chance to photograph them. I asked Casie to write a little something about her inspiration, so I'll let her take it away! I feel about Star Wars the way Phasma feels about FN-2187, "so good to have you back." I have seen The Last Jedi 7 times and I would probably be watching it right now if I weren't explaining how to make these cookies. Rian Johnson has made the most visually striking Star Wars film to date. His use of the color red is both beautiful and extremely effective. While the scene in Snoke's throne room is my personal favorite, I'm here to talk about Crait. Crait, the mineral planet covered in salt instantly inspired both Grace and I with many nerdy ideas. (I'm sure everyone saw her delicious idea for red Crait margaritas with a salted rim. They were a big hit!). In the film, the First Order has landed on the planet and is hoping to snuff out the Resistance once and for all. The Resistance fighters are locked inside an old Rebellion fortress, with only a few ships and fighters hiding out in trenches. General Ematt from the Resistance steps out from the trenches to get a better look and his footsteps leave deep red footprints in the salt. I tried to figure out a way to recreate the first time you see the red exposed on the planet covered in white. I really wanted to bake something that looked like salt but had the red footprint indentation, so I decided to make a sugar covered sandwich cookie with raspberry jam. Make the sugar cookie dough as instructed in Haniela's recipe. While your dough is chilling you can make your buttercream and shoe print stencil. You can use the icon here or a simple Google image search to find your preferred shoe shape. I used a round 3 1/2" cookie cutter and made the shoe print 2 1/2" long. Trace the shoe onto your stencil paper leaving at least an inch around the image. Using an exacto knife, cut out the shoe print. I found having the shoe stencil several inches wide and cutting out the center easier than placing the small shoe cut out on each cookie and having to cut around it. To make the buttercream combine the butter and powdered sugar in a medium bowl. Beat on low speed until completely mixed. Add vanilla and milk and mix again. The frosting will be thinner than a normal buttercream so it spreads easily on the cookie. If the frosting is thick it will also make the sanding sugar clump up and not give a smooth finish. Store in refrigerator until ready to use. Preheat the oven to 375 degrees. Roll out the cookie dough on a floured surface or parchment paper until it's 1/4" thick. Then cut out the cookies using your round cookie cutter. On half of the cookies, place the stencil in the center and cut out the shoe using your exacto knife. Place the cookies on a baking sheet and chill in the refrigerator for 15 minutes. Bake the cookies for 9 minutes. Cool for several minutes on baking sheet before transferring to a cooling rack. To decorate the cookies you'll first put the sanding sugar in a wide, shallow bowl or small plate. Using your buttercream, frost the top of each shoe print cookie evenly to the edge. Using your wrist, rotate the frosted cookie in the sanding sugar until evenly covered. Sprinkle on sugar to any exposed frosting spots. 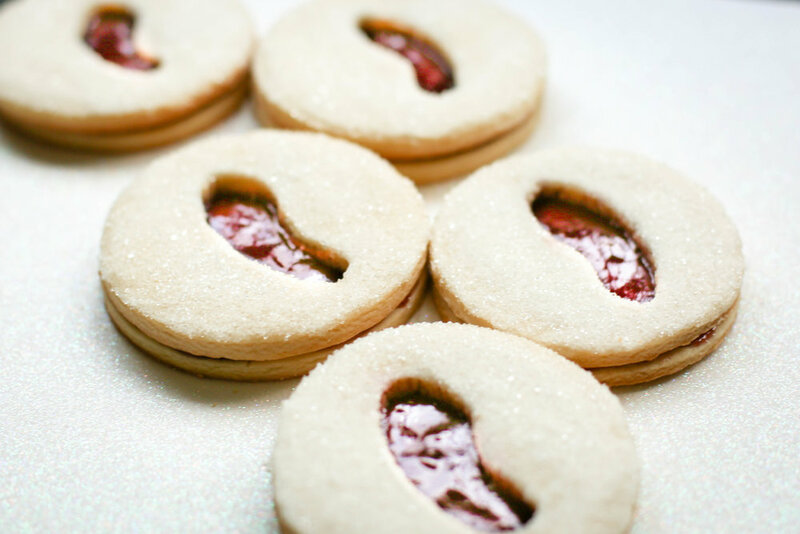 Spread the raspberry jam over the top of each circle cookie. Place the frosted cookies on top of the jam cookies. Now you have a little piece of Crait to tide you over until The Last Jedi comes out on blu ray.